College Soccer Recruiting - How Does the Process Work? When I am asked by friends and family about how the college athletic recruitment process works, I am left pondering by the absolute vagueness of the question. There simply is not a cookie-cutter response that would work for everyone. With a never ending amount of variables which are involved, the better question would be “How would college athletic recruiting work for me?” These variables are, but not limited to: gender, sport, size of school, size of program, the family’s financial background, the student’s academic history, whether Division I, II, or III, and the most important factor-the prospective student athlete’s actual athletic ability. By examining these in depth, one can conclude which type of school and program to target, and to be the best prepared to expedite the process in picking the school that would be an ideal match. The relevance of Title IX and how that would affect one’s recruiting process could not be greater. With both a Men’s and Women’s Athletics Program having equal resources, some sports may absorb a majority of the funding allocated to athletics. For example, if a school has a Football program which costs quite a bit of money, they likely will not be allocating that much money to other male sports. Conversely, as a female student athlete, a Football programs means that the institution must equally fund female athletics to stay compliant with the 1972 legislation which came to pass under Richard Nixon’s administration. At larger institutions the disparity may not be noticeable but will be more so at a smaller athletic program. It should not come as a surprise that Men’s Basketball and Football are the main sports at a majority of schools across the NCAA spectrum. With that said, other sports generally take a back seat in terms of scholarships awarded, resources provided such as academic advisement, and recruiting budget, amongst others. So from a male athlete’s perspective, you must be prepared to send highlight videos, take care of all your paperwork in terms of admissions and the NCAA clearinghouse, and applying for academic and work-study grants. The Soccer or Golf programs likely will not have the resources to come see you play and dedicate a staff member to handle all the requirements for participation. The same can be said for the female athlete. Women’s Volleyball and Basketball will generally absorb a plethora of the allocated budget so if you are a swimmer, be prepared to do a lot of the small tasks just mentioned. As mentioned previously, some sports are prioritized over others at many schools nationwide. However, some schools provide major resources to non-traditional and less popular sports. Ivy League schools for example all support their Rowing programs and these competitions generally are large scale events attracting large crowds. Johns Hopkins University in Baltimore, Maryland boasts Men’s Lacrosse as its marquee sport and is a perennial national powerhouse. With that said, the size of the school and size of athletic program may be irrelevant if the student athlete can identify the program which has the resources prioritized it to it by the institution. Size of school and size of program do not always go hand in hand, and it is up to the student athlete to identify these programs within their sport to find the program that best suits his or her desires and needs. One may wonder how this is relevant to the recruitment process, but it is an extremely important factor unless you are a 5-Star Basketball prospect or All-State Quarterback. Many private schools come with large tuition costs that are not always met with athletic awards of the same amount. This makes Financial Aid (FAFSA) from the government a major contributor towards the cost of the athlete’s education. Affluent families generally can afford whatever school their child chooses regardless of the cost, and low income families will receive larger assistance from FAFSA, thus making studying at these schools possible. However a middle income family which may not receive that much assistance from FAFSA, and does not have a lot of disposable income to spend on education, may not be able to send their child to these private institutions regardless of the size of award received from the athletic department. Not only does academic history including GPA, SAT, and ACT and in international cases TOEFL scores indicate the direction one should take in the level of education being offered at various institutions. It also is a major factor in the amount of grants the student-athlete may receive as part of the scholarship package the school may offer along with the athletic award. Many athletic programs can get a perspective student-athlete admitted regardless of their grades as long as they will be eligible for participation by the NCAA, but the better the grades the more the likelihood that the financial burden placed on the family will be decreased. Beyond the financial aspect, better grades are also a reflection of the commitment level of the student and dedication to excelling. It is also a key indicator that coaches will not have to worry about future eligibility issues and that there likely will not be any off the field related issues that may put the program and coach in bad standing with the Athletic Director and University itself. Most athletic programs are now tracking graduation rates of scholarship athletes and holding coaches accountable for the type of athletes they are recruiting. Understanding the difference between the three levels is fundamental to picking not only the right school but also the right athletic program. Generally every high school athlete dreams of being a scholarship DI athlete. Even with the large amount of DI institutions in the United States, the percentage of participants is so minuscule it is prudent that perspective student-athletes explore all their options. DII schools are generally smaller schools with smaller enrollments and offer less academic programs. The athletic standards that need to be met by the DII athlete is a bit more forgiving than the DI level, but are generally in line with each other. Participation levels are lower in DII due the implied lower academic standards to assist student-athletes meet minimum compliance standards. DIII schools operate on a completely different platform than DI or DII athletics. DIII programs do not offer athletic scholarships and operate with the actual student-athlete mindset versus the athlete-student view taken by many DI and DII athletic programs. These DIII schools vary in size from large scale state universities to very small liberal arts colleges. Some DIII facilities are better than their DII counterparts and are comparable to DI in numerous cases. This is relevant to an athlete looking to play college sports because that athlete must determine what they will prioritize over the next four years while studying towards a degree. DII and DIII schools generally play a locally oriented schedule with games mostly played on the weekends. DI programs generally have a regionally based schedule with some even making cross country trips for road games. We are all aware of the Maui Invitational Classic in Hawaii which marks the beginning of the DI College Basketball season drawing the nation’s best programs and which takes the athlete-student away from their class schedule and academic responsibilities. These type of activities normally do not exist on the DII and DII level. Arguably the most relevant variable in the equation is the athletic ability of the athlete which will have a major say in the level of programs they will be recruited by. The better the athlete the less they will have to worry about, in terms of sending videos and contacting coaches because they will come to watch you live because they already know who you are. Realistically, the better the athlete, the more flexibility will be given towards things like academics and unfortunately even with off the field matters such as a police record. We wish these things to not be true but one must not ignore the world we live in. We have all heard stories of gifts being lavished on big-time prospects and the like, but those are limited to extremely high end Men’s Basketball and Football programs. DII and DIII programs operate under far less pressure and the “win at all costs” mentality does not exist as there is not television and sponsorship money hanging in the balance. Ultimately, the athletic ability will dictate which of the three levels the athlete will eventually play at. The other variables will help guide in deciding which school to choose that best suits what they are looking to study and the atmosphere which they will spend the next four years of their life. As one can decipher, there is no simple answer in how the college athletic recruitment process works. The amount of variables are so vast that a certain amount of homework must be done to narrow the scope of schools that may be a fit for your overall needs. In many cases it is the athlete who is recruiting the coach to take a look at their video and educating him/herself as to what that institution offers on the field and in the classroom. It is almost as if the student is trying to sell the coach, which is in direct contrast to high-end DI Football and Basketball programs who ignore rules and morals in their recruiting process. Many times, athletes are blinded by the notion that they must play DI or they have failed, and all the money their parents spent on their academy programs through the years was for nothing. I myself had that mindset as a 17 year old high schooler, and I failed to even look beyond the athletic program and educate myself on the social aspect of campus and most importantly the majors being offered. I consequently spent the following four years operating as an athlete-student and put my academics on the back burner. The college experience should not be limited to one focus, but to incorporate everything the school has to offer to make oneself a more well-rounded and knowledgeable person. Aris Alpian is the Assistant Men’s Soccer Coach at Felician University in Northern New Jersey. They participate in the DII Central Atlantic Athletic Conference. He was a DI goalkeeper at Hofstra University where he received a Bachelor’s Degree in Business Management and is currently studying for his Master’s Degree in Science in Sports Management from Southern New Hampshire University. The college soccer recruiting process is explained by Assistant College Soccer Coach, Aris Alpian (Felician University). 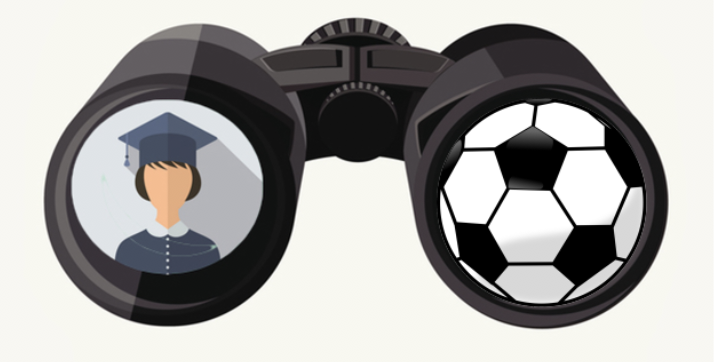 Learn how college soccer recruiting works from an insider -- a college soccer coach!